Literally translated to mean the land of coconuts, Kerala with its signature houseboats and swaying coconut trees along the Arabian shoreline is a great destination to begin exploring and unravelling the tropical paradise that is India. Legend has it that Kerala was reclaimed from the ocean in the Tretayuga by Parasurama, an incarnation of Lord Vishnu and the sixth of the dasaavataaras. It is said that he threw his battle axe into the sea from what is today Kanyakumari, the southernmost tip of India. And the land that lay submerged between there to today’s Gokarna was retrieved. This ‘Land of Parasurama’ is now the South Indian state of Kerala. & If only the marine fossils found in Kottayam could bear witness to this legend. Mythology aside, Kerala has always held an important place in world history. Infact, it is this Spice Garden of India that was once the busiest of ports on the world trade routes. And, it was here that Vasco da Gama landed back in 1498, opening the floodgates of global imperialism. Why should you visit Kerala? How to get to Kerala? Where to stay in Kerala? What are the Top Things To Do in Kerala? Catch a Temple Festival or Stumble upon one! What are the Offbeat Destinations to visit in Kerala? Nestled between the Western Ghats and the Arabian Sea, along the western coastline of India, at its southernmost tip, lies Kerala. A narrow stretch of land, networked by over forty four rivers, this geographically diverse land has truly been blessed. For here you will find Mother Nature has been boundless in her abundance. From countless golden beaches and verdant hill stations to lush plantations of tea and spices. Kerala has an unmatched appeal in being able to cater to every kind of traveller. There is a destination both offbeat and popular in Kerala to gratify everyone, from the adventure seeker to the romantic soul. Be it hiking trails, water sports, Ayurvedic retreats or even a hippie corner for the artsy ones, Kerala has an option. Not to forget Kerala’s most compelling draw, its network of beautiful backwaters. One can get to Kerala either from Thiruvananthapuram (Trivandrum) which is the state capital or from Kochi (Cochin); both, important cities with international airports. Kozhikode (Calicut) also has an international airport and can be a good starting point if one wishes to explore the Malabar Region. I however flew into Thiruvananthapuram and left from Kochi, exploring the state from the touristy South to the offbeat North. Winter is typically the best season to visit Kerala, for the weather is cooler and generally pleasant. So plan your trip between October to January. If you want to avoid the crowds and rather visit the state off season, then a Monsoon trip between the months of July and September would be a good idea. And, if the lure of the monsoon clouds isn’t enough then there are the roaring waterfalls and the crashing waves to induce you to make a trip to Kerala in the monsoons. Besides, colours in India always look fresher and brighter after the rains. Making the luxuriant green of Kerala, a perfect setting to slow down. Monsoons are also the ideal time for Ayurvedic treatments, as it is the most conducive time for natural bodily healing. Summers are extremely hot and humid. Definitely not the time to visit Kerala! From resorts right on the beach to those located inside wildlife sanctuaries, there are over twenty seven KTDC properties, owned and run by the State Government across Kerala. We stayed at two – KTDC Mascot in Thiruvananthapuram and KTDC Tea County in Munnar and spent an afternoon at two – KTDC Samudra in Kovalam and KTDC Bolgatty Palace & Island Resort in Kochi. I can say they were all beautiful, well maintained properties with a good spread of food for both vegetarians and non vegetarians. To find or book a Government run property in Kerala: Click here. With a destination as diverse as Kerala, when planning a holiday here, one can choose between a variety of resorts in different locations, depending on where one is headed to. Beach Resorts: Be it something as popular and accessible as the Kovalam Beach or something as secluded and pristine as the Nattika Beach, there are atleast a few Beach Resorts in every village, town or city that boasts of a beach. Backwater Resorts: From the tranquil backwaters of Alappuzha to the shores of the Vembanad Lake in Kumarkom, Backwater Resorts offering panoramic vistas of the picturesque waterscapes dot the canal banks of Kerala. Pick a backwater destination and let a houseboat take you there, effectively splitting your time between land and water. Plantation Resorts: In the mist laden, spice scented hill stations of Kerala, are acres and acres of plantations from coffee to cardamom, from tea to vanilla. You can find a Plantation Resort that appeals to you in any part of Kerala. Munnar, Wayanad and Thekkady being the popular choices. Kanan Beach Resort in Nileshwar, Kasaragod and Ramada Resort Kochi in Kochi are my top two. The wooden cottages of Kanan Beach Resort, with their eclectic interiors and glass doors that open out to the sound of the ocean, are beyond gorgeous. While, for a resort in a bustling city, no one can do better than the Ramada Resort Kochi. It is a sprawling property with all the amenities of a modern business hotel on the inside and quaint red roofed cottages in the local style on the outside. Here too, you wake up to a beautiful dawn thanks to the meandering pool – punctuated with little wooden bridges – that passes by most cottages. I would also recommend Vistara by The Lake in Wayand, and The Leaf in Munnar. Though both are great looking properties set in stunning locales, it is the people here who win you over with their warmth and efficiency. NOTE: Besides these resorts, I also recommend Grand Hyatt Kochi Bolgatty on Bolgatty Island in Kochi, Blanket Hotel and Spa in Munnar, CGH Earth Marari Beach in Alappuzha and Fragrant Nature in Fort Kochi. Read: A full review of my experience at the Grand Hyatt Kochi Bolgatty. The other hotels that I stayed at don’t find mention here because I would not recommend those to my readers. At the Kollenkeril Plantation Bungalow, Munnar where the Kerala Hats Homestay and Tourism Society had hosted us for tea. All the homestay owners in the area had come together to give us a glimpse into the ‘Homestay Experience’. Homestays in Kerala aren’t your typical intimate one bedroom cozy houses, though there are those too for the budget conscious traveller. Here, where it is said the homestay culture first came to flourish, there are eco conscious bungalows on 400 acre coffee estates even, for those who want an authentic experience while not having to let go off their creature comforts. For a list of Kerala Tourism approved Homestays: Click here. To explore Munnar Homestays: Click here. Think a Kerala holiday and houseboats are the first thing that come to mind! But to actually spend an afternoon doing nothing on a houseboat, for once to disconnect and just be, make for some magical afternoons. The houseboats of today, were originally ‘rice boats’ used to ferry farm produce from the water-locked villages along the inland canals, before the advent of roads and bridges that made it easy for the farmers to trade. Kettuvallams, as these traditional country crafts are locally known, go upto over 60 feet in length and come equipped with everything that a home would need – bedrooms, bathrooms, a kitchen, a dining and lounge area even. To stay, at least a day, on a Houseboat is surely a not to be missed ‘Kerala Experience‘. I stayed on a Lakes & Lagoons Houseboat. The houseboat itself was comfortable and clean and the freshly made food was served hot and delicious. Ayurveda, the Science of Life is an ancient Vedic philosophy and one of the oldest holistic healing systems in the world that works on bodily balance through the harmony of the mind, body and soul. And, Kerala is the one place where it has thrived over centuries and generations of Ashtavaidyas, even as mainstream medicine gained wide spread acceptance across the rest of the country. This alternative form of medicine has today evolved to become an everyday wellness system. From therapeutic treatments to rejuvenation programmes, Ayurveda is easily accessible in Kerala and is offered across a variety of Ayurvedic Retreats that can go from a simple city based Ayurvedic Hospital to an upmarket secluded beach resort. With a six hundred kilometre coastline that stretches along almost the entire length of the State, Kerala is dotted with numerous golden beaches. From famous white sandy beaches to fishing hamlets, from sun kissed isolated beaches to coconut groves, from historic beaches to boatbuilding yards; every beach is distinctive and singular. You will be spoilt for choice with the Kerala Beaches. Take a walk down the Kappad Beach in Kozhikode, where Vasco da Gama first landed over five hundred years ago or watch the Olive Ridley turtles come out to play from their nesting ground that is the Payyoli Beach, also in Kozhikode. Or just go from one popular beach to the next, from Kovalam to Varkala, from Marari to Fort Kochi. Wayand’s terrain calls you to get outdoors. Dominated by the Western Ghats, this wilderness world is accessible only by road and just getting there is an off-roading experience in itself. From rappelling to trekking through jungle trails that lead you on to neolithic caves there is much to explore here. Not to mention the wild life, valleys, waterfalls and islands that dot the landscape. We even tried our hand at bamboo rafting in a setting straight out of Jurassic World! You can book your Wayanad Outdoor Adventure with Muddy Boots. They organised a day trip for us. With so many beaches in Kerala, that go from crowded to secluded in a heartbeat, there is no dearth of finding a beach or a water sport that appeals to you. We went Kayaking from the Dharamadam Island and rode a Quad Bike on Asia’s longest drive in beach. Both among the unspoilt and quieter beaches of North Kerala, in Kannur. We also got to go on a speedboat at first light in Kumarakom and chanced upon local fishermen out on the waters with their first catch of the day. Other water sports that one can indulge in, here, in different parts of Kerala, are canoeing, sailing, waterskiing, white water rafting and wind surfing. The best beaches for adventure are the Muzhappilangad, Varkala and Kovalam beaches. Forty four rivers that drain into the Arabian Sea, join with thirty four meandering inland lakes that are networked by innumerable canals, to bring to Kerala, its nine hundred kilometres of emerald green waterways that are the backwaters. An experience unique to the state, floating by in a traditional wooden country craft on the languid backwaters is like no other. Cruise past lively little villages sheltered in the swaying coconut trees and the golden green paddy fields; as you laze under the afternoon sun, sipping a lemonade, book in hand. While the eight hour trip from Kollam to Alappuzha is the longest backwater cruise in Kerala and the most popular, the Valiyaparamba route from Kasaragod to Kannur is the less crowded alternative. Browse for Government approved Houseboat Operators. “Time is rather abstract in Fort Kochi”, proclaims the Kerala Tourism website and I couldn’t have described Fort Kochi better! Artistic, quirky, colourful, that is Fort Kochi for you. It is here that you will find those iconic Chinese fishing nets – that have come to be synonymous with Kochi and Kerala itself – lined up against the setting sun. Steeped in history and culture, it was here that the illustrious explorer Vasco da Gama was originally buried. In the oldest European Church in the country. Need I say more? The historic locales of Fort Kochi are also the main venue for the artists led Kochi-Muziris Beinnale. Check out the Kochi-Muziris Biennale, the fourth edition of which is set to happen from 12th December 2018 to 29th March 2019. From the grand festivals of major temples to the small ones of local village temples, ‘Temple Festivals of Kerala’ are a visual spectacle. They are an assault on your senses. It isn’t just about the majestic elephants, caparisoned and golden, or the riot of colours or the crowds and the chaos. It is, maybe, a strange alchemy. Of religious fervour and childlike amazement at the spectacular show that is put on annually, in every corner of the state. Whatever it is, you get carried away and it is an experience like no other. In Kerala there are both kinds of temple festivals, with and with out elephants. I have witnessed both. For a full list of Kerala Festivals: Click here. NOTE: There has been, a now long drawn debate on how ethical it is to have elephants in a temple festival – whether they are treated well, if they are subjected to inhumane control. It is true, that, they are chained. But, it is also true, that every child in Kerala hero worships his favourite elephant, knows all their names and eagerly waits to cheer for his favourite to be the star of the upcoming Pooram. I love elephants, but I also respect tradition. I am sorry, but, this is still an unresolved conflict in my head. If you have any insights on this with enough facts to back them, please do let me know in the comments at the end of this post. Any healthy discussion towards understanding the issue better is wholeheartedly welcome. Kerala is home to some of the oldest classical arts. From dance dramas and temple rituals that are counted amongst UNESCO’s Intangible Heritage of Humanity to ritualistic folk and intense martial arts even. Elaborate costumes, painted masks, vivid facial makeup that add to the fierce expressiveness of the performers and graceful movements characterise almost all of these performing arts. 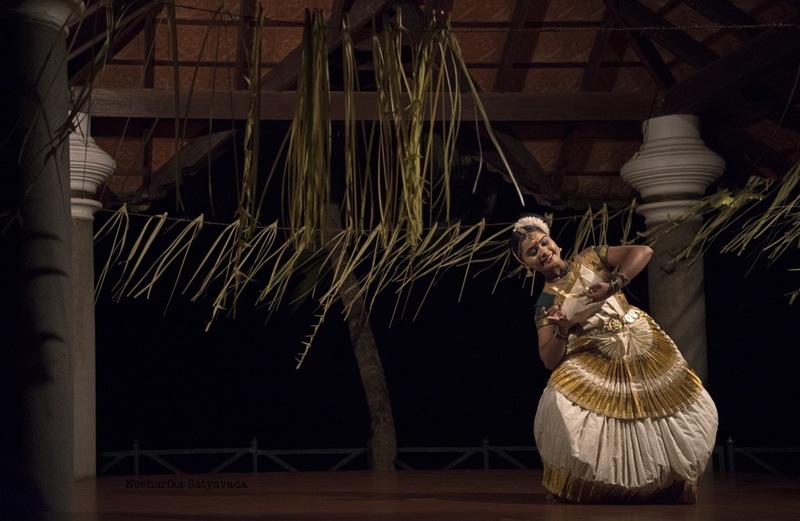 So, when in Kerala, enjoying a classical art performance – be it the popular Kathakali and Mohiniyattam or the lesser known Kalaripayattu or Theyyam – is yet another ‘Kerala Experience’ not to be missed. Mohiniyattam, the more feminine of the two traditional dance forms of Kerala, traces its origins back to Mohini, the mythical enchantress who was none other than the Lord Vishnu come to vanquish the demon Bhasmasura in a dance off. Interestingly, it is also in Kerala that the son of Lords Shiva and Vishnu (as Mohini), Ayappan is revered and the famous Sabarimala Temple – that draws one of the world’s largest annual pilgrimages – dedicated to him is located. Nestled deep in the hills of the Periyar Tiger Reserve. For the 2018 Theyyam Calendar: Click here. Home to the ancient Vedic medicine of Ayurveda, Kerala is the one place in the world that you cannot miss out on experiencing Ayurveda as a wellness programme at the very least, if not as a curative medical treatment. From a simple foot massage to the famous Shirodhara, it is easy here, to find a restorative Ayurvedic experience that fits your needs. The very heart of the backwaters and often referred to as backwater country, Alappuzha is Kerala’s crown jewel. With its expansive network of lakes, lagoons and rivers meandering through lush green villages, its beauty is unparalleled and reason enough for Kerala to proudly proclaim for itself the tag of ‘God’s Own Country’. Kerala’s largest and most sought after waterfall, the Athirapally Waterfalls, near Thrissur, cascades down a mighty eighty feet. This densely forested area is home to not one, but four endangered species of the Hornbill! The sprawling gardens of the seventeenth century Bekal Fort and the adjoining stretch of Bekal Beach have always been much sought after by the locals. For wander there of an evening and you will see families, usually large, sitting down to a picnic while the kids scamper about in this erstwhile military stronghold of the Malabar province. It is only now, with the advent of glamorous resorts here, that this seaside town in North Kerala is slowly but surely opening up to tourists. Fifteen minutes from the mainland of Kochi City in Ernakulam is Old Kochi, popularly known as Fort Kochi. Fort Kochi has had a long and eventful past, from being a little known fishing village to becoming the first European township in India, every lane and building in this part of Kerala has a tale to tell. Home to the famous Ashtamudi Lake and Wetland Eco System, Kollam was once Kerala’s trade centre and is today the gateway to the backwaters. Here is where the longest and the most popular backwater route to Alappuzha begins. It is also here, near Kollam, that Jatayu Earth Centre, with the world’s largest bird sculpture – of the mythological Jatayu – is being constructed. Hands down the most popular beach of Kerala. Kovalam is easily accessible from Thiruvananthapuram. Three crescent shaped bays, separated by rocky outcrops and lined in coconut palms, together comprise this beach which is touristy enough to be dotted with resorts, Ayurvedic centres, restaurants and storefronts. Kerala’s number one tourist island, Kumarakom derives its name from the words kuminja (heap) and akam (inside) referring to how the island came to be. From a natural accumulation of mud and sediments. Home to a bird sanctuary surrounded by beautiful backwaters, Kumarakom is a great place for a laid back holiday. Where one can wake up every morning to birdsong, by the tranquil backwaters. After the Alappuzha Backwaters if there is a star on Kerala’s tourist map, it is Munnar. Fed by a confluence of three mountain streams Mudrapuzha, Nallathanni and Kundala, Munnar with its luxuriant gardens of tea (rolling off along the hillside for as far as the eye can see) and its crisp mountain air, can only be pleasant. Owing to which it is also amongst India’s list of top honeymoon destinations. The picture book town with its stores of home made chocolates only add to Munnar’s charm. Home to one of the more popular tiger reserves of the country, the Periyar Wildlife Sanctuary, Thekkady, is known for its unending hills of dense evergreen forests. So, besides spotting herds of wild elephants, rafting is also a much loved activity here. Fabled for its spice gardens, Thekkady is also popular for plantation tours, treks and safaris. A hippie haven, Varkala is one of those towns typical of India, where you wouldn’t know if East meets West or vice versa. Originally known for its ancient temples and sacred beaches like the Papanasanam Beach, where one dip in the sea is believed to wash away all of one’s sins to what it is today, a cliff hugging backpacker beach town. Though Wayanad is counted amongst the popular tourist places of Kerala, it is seriously underrated! Agreed that it can only be accessed by road. But, this trip to the heart of wilderness in the Western Ghats is one jeep ride that is totally worth it. And, if you are an elephant lover, then the Muthanga Wildlife Sanctuary, a Project Elephant site, is where you ought to be. For here you will see them in the wild, and free. If you want to get up close and personal with Nature, then Idduki is the place for you. While Munnar is just one of the hill stations in the region, over fifty percent of Idduki is carpeted in forests, making it the perfect destination for treks, plantations tours and forest trails. One such relatively unknown hill station here is Vagamon. It is also here in Idduki, that you find the Neelakurinji, a rare blue flower that only blooms once in twelve years. And, because this flower is to bloom this year, 2018 has been declared as ‘The Year of The Neelakurinji’, by the State Department of Tourism, Kerala. Get off the tourist trail in Kannur for some pristine white sand beaches, uninhabited islands and drive in beaches that are absolutely ideal for water sports. These secluded beaches also make for the perfect setting, when after an intense day out in the sun, you want to retire to a quiet night by the sea. It is believed that Kannur is the ancient port of Naura. From where, timber for Solomon’s Temple in Jerusalem was collected and shipped. There is much more to Kasaragod than the much talked of Bekal Fort and Beach. More forts and even more beaches, untouched and restful. But Kasargod’s hook remains, India’s oldest ritualistic temple dance, the Theyyam. The Food Capital of Kerala, Kozhikode is where the celebrated Malabar Cuisine comes from. From the Calicut Biryani that traces its flavours back to the Arabs who landed here to the purely local unnakkaya, a deep fried snack made from sweetened ripe bananas rolled in cashews and raisins; Kozhikode is known for its distinctive food culture. A thriving centre of trade in the first century BC, the ancient port city of Muziris is today the Muziris Heritage Village. A unique heritage conservation project that takes one on an archaeological trail for a brief look into India’s dramatic past. Back then, Muziris was the launching pad for many a religion in the country; Islam, Judaism and Christianity being the most prominent. The Cultural Capital of Kerala, Thrissur is best known for its Pooram, the Thrissur Pooram. Where caparisoned elephants come out with the local Gods on their backs, to a celebration of lights and colours. All the local temples in the region participate in the Thrissur Pooram. Guruvayoor – India’s third largest temple and probably the only one with a palace for temple elephants – is also near here. The Valiyapramba Backwaters in Kasaragod, near Bekal, though not as popular as the Alappuzha Backwaters are just as picturesque, if not more. As is typical to North Kerala, this stretch is still relatively untouched by mainstream tourism making for less traffic on the waterways. And the pretty as a picture islands make for great stopovers along the way. North Kerala, from the Malabar Coast to Kozhikode is a pristine stretch of virgin beaches untouched by tourism. This region recently made it to Lonely Planet’s list of Top 10 Travel Destinations in Asia and with a new International Airport all set to open its doors in Kannur, there couldn’t be a better time to explore North Kerala, before it quickly transforms from offbeat to mainstream. Besides the bigger cities of Kozhikode and Thrissur and the more widely known Wayanad and Bekal; there are Kannur and Kasaragod. North Kerala is where all the action is, from temple festivals and ritualistic performances to water sports, there is much to see and do. While all the offbeat destinations are in North Kerala, if you do not want to miss out on the popular tourist circuit, then South Kerala it is. Alappuzha, Munnar, Kumarakom, Kovalam, Varkala, all the beaches, backwaters and hill stations are in the south. So the distinction is clear and travellers often decide their itinerary based on this. Usually making two trips to Kerala to explore both its touristy side and the offbeat. This was the itinerary for our 15 Day Road Trip aboard The Kerala Blog Express Season 5. Though some of the popular tourist destinations are not included in this itinerary, we did manage to cover the entire length of the state and also explored both North and South Kerala. Drive Time: 40 minutes. Kovalam is 20 kilometres from Thiruvananthapuram. Kuthiramalika Palace in Thiruvananthapuram was the first stop on our two week road trip across Kerala. It sure set the tone as to what to expect along the way, accompanying us as our bus traversed over one thousand six hundred kilometres – beautiful redbrick houses hidden in verdant banana trees and swaying coconut palms. Located just outside the Ananta Padmanabha Swamy Temple, the Kuthiramalika Palace or the Horse Palace, was built by Maharaja Swathi Thirunal Balarama Varma, the Maharaja of Travancore in the traditional architectural style of Travancore. It is infact the exquisite wooden carvings of the horses on the facade that give this dark wood palace its name. A Divya Desam, the Anantha Padmanabha Swamy Temple is one of the hundred and eight principal centres of worship dedicated to Lord Vishnu. Unlike other temples in Kerala, this is built in the Dravidian style of architecture, with a towering gopuram that is the signature feature of a typical South Indian temple. But, what is distinctive about this temple is that the presiding deity, Padmanabha Swamy, is manifest in the Anantha Sayanam Posture, meaning, that the Lord Vishnu is reclining on the serpent Anantha in yoga-nidra or eternal sleep. The Anantha Padmanabha Swamy Temple suddenly shot into limelight when under the orders of the Supreme Court of India, five of its six secret chambers were opened in 2011 and the temple’s untold riches were documented in mainstream media. Thiruvananthapuram literally means town of the divine Anantha. Yes, home to Anantha, the very snake on who resides Padmanabha Swamy, Lord of the richest temple in India, the Anantha Padmanabha Swamy Temple. Sunsets at Kerala’s most popular beach fringed with swaying coconut palms are a glorious riot of colours. And, there are three beaches – separated by rocky outcrops on the main beach of Kovalam – to choose from; Lighthouse Beach, Eve’s or Howah Beach and Ashok Beach. Drive Time: 1 Hour 20 Minutes. Kollam is 65 kilometres from Thiruvananthapuram. We spent an afternoon and a night on a houseboat going from Kollam to Alappuzha. A magical afternoon of gliding on the briny backwaters watching the villages go by, as they stirred to life, with villagers coming out to do their daily chores by the water in the fading afternoon light. Drive Time: 1 Hour. Kumarakom is 35 Kilometres from Alappuzha. After a traditional Kerala breakfast of Ada (rice parcels of coconut and jaggery steamed and served in banana leaves) on the houseboat, we drove to one of the villages by the banks of the Kumarakom Backwaters. The Kerala government has partnered with local bodies in the popular tourist regions of Kerala, to promote tourism responsibly and minimise the negative economic, environment and social impact of tourism. By participating in this Responsible Tourism Initiative, locals benefit from giving visiting tourists an authentic experience of understanding the daily lives and livelihood of the villagers. To book your own ‘Village Life Experience at Kumarakom’: Click here. Drive Time: 25 Minutes. Marari Beach is 15 kilometres from Alappuzha. NOTE: We did not stay in Marari this day, but drove to CGH Earth Marari Beach Resort for Dinner from Fort Kochi on the last day. It is a beautiful property, the food is delicious and the service is just the right amount of helpful and friendly. Drive Time: 1 Hour. Kochi is 40 kilometres from Muziris. The Muziris Palace, originally the home of Paliathachans, Prime Ministers to the Kings of Kochi, became a significant part of history when a palliathachan hid his King here, during a time when the royal household was under threat from the Portuguese. Today, it is a history museum chronicling those times and events. With its elaborately carved wooden staircases in the traditional Dutch style and the red tiled roof of a typical Kerala house, the Paliam Kovilakam is a beautiful building hidden in the leafy walkways of Chendamangalam in Muziris. Popularly known as the Jewish Synagogue, the Paravur Synagogue though no longer an active place of worship has been converted to a Kerala Jews History Museum that is open to public during the day. While the present day structure was built only four hundred year ago, it is believed that there was an older synagogue in its place, dated to be from the 12th century, on the ruins of which this was built. To plan your visit to the Muziris Heritage Project: Click here. Drive Time: 3 Hours 15 Minutes. Munnar is 130 kilometres from Kochi. Lose yourself in the manicured hedges of the resplendent tea gardens. Meet the tea pickers, the smiling ladies with the delicate fingers. The only working tea factory in Munnar open to public, the Lockhart Tea Factory offer guided tours that take you through the hundred and sixty year old factory to watch and understand first hand how tea is processed. You can book your day tour in Munnar with Route 49 Adventures. They organised the plantation and factory tour for us. Walk around the charming hill station, shop for home made chocolates. Chat with the locals, take back souvenirs and travel stories. Where to Stay in Munnar: The Leaf Munnar, Blanket Hotel & Spa, Tea County and/or Homestays. Drive Time: 3 Hours 45 Minutes. Thrissur is 160 kilometres from Munnar. Tracing its origins to as far back as over two hundred years ago, the Thrissur Pooram which is Kerala’s biggest and most prominent festival brings together ten local temples at the Vadakkunnathan Temple in the Malayalam month of Medam. All the deities arrive on elephant backs at the temple premises for stunning celebration that goes through the night. Drive Time:2 Hours 45 Minutes. Kozhikode is 120 kilometres from Thrissur. On our way out of Thrissur, the day after the Thrissur Pooram, we made a quick stop at this museum housed in a beautiful two storeyed traditional Kerala house. For those interested in knowing the five thousand year old legacy of Ayurveda The Vaidyaratnam Ayurveda Museum in Thrissur has interesting displays and presentations. Drive Time: 40 Minutes. Nattika Beach is 25 kilometres from Thrissur. A little known fishing hamlet, Nattika Beach found itself on the tourist map of Kerala after being the location for a hit Malayalam Movie. Drive Time: 2 Hours. Wayanad is 85 kilometres from Kozhikode. Kalaripayattu, the fourth century martial art that is considered to be the fore runner to Kung Fu, is probably more akin to ballet, than just a form of self-defense, thanks to the performer’s graceful movements and intense facial expressions. But this classical Kerala art too is definitely worth a watch. And, probably even worth training in, for those wanting to achieve a sound mind in a sound body. We were witness to a showcase match of Kalaripayattu at the CVN Kalari Training Centre. Sweet Meat Street or SM Street in short was once the busiest of food streets where the roads used to be lined with stalls of halwa (sweet meat for the British, who gave this street its name). It still is one of the busiest streets in Kozhikode owing to the plethora of the shop selling everything from boho clothes to sliver trinkets. Minus the sweetmeat stalls, today, the most interesting features of SM Street are the delightful old Parsi temple hidden behind a nondescript gate and unruly foliage and the statue at its entrance. The statue is of SK Pottekkatt, who wrote the award winning Malayalam book, Oru Theruvinte Katha. The 1960 novel talks of life on the streets and is set in this very SM Street. Murals depicting scenes from the story line the cobbled pathways leading you into the celebrated SM Street. Drive Time: 20 Minutes. Beypore is 10 kilometres from Kozhikode. Go inside a Uru in Beypore and see master craftsmen at work, bringing to life this striking handcrafted teak wood trading vessel that traces its origins back to the Arabian Dhow. The very first pre historic drawings in India were discovered here in Eddakal. A kilometres trek takes you to the caves, where, distinct petroglyphs are found engraved into the cave walls. Five kilometres from Edakkal, on Thovarimala, in yet another rock shelter, engravings probably dating back to 1000BC were discovered. Only recently. So, this area is yet to receive any kind of formal protection and/or conservation efforts. Which also means the Ezhuthapara Caves are relatively unknown. This is where we hiked to, instead of going to the Eddakal Caves. You will not come across anyone else on this hike across plantations, grassy meadows and plateaus, even as you descend sharply to the cave. We also did some Rappelling along the way, in Thovarimala itself. Float along the River Vythiri, on a bamboo raft. Bird watch as you glide through a dense forest of green and you might just spot the famed Malabar Grey Hornbill, the most recognisable bird endemic to the Western Ghats. Once you reach mid river you can even try your hand at poling the raft forward. That, is what I did. Drive Time: 3 Hours. Kannur is 120 kilometres from Wayanad. Drive Time: 3 Hours. Sargaalaya is 95 kilometres from Wayanad. 1 Hour 20 Minutes. Sargaalaya is 42 kilometres from Kozhikode. The Sargaalaya Arts & Crafts Village in Kozhikode brings together artisans from across Kerala under one roof. Here you can shop for traditional Kerala handicrafts. NOTE: The Sargaalaya Arts & Crafts Villages on the route to Kannur from Wayanad is quite a detour. I wouldn’t recommend including this in the itinerary on this day. Visit the crafts village when in Kozhikode. Drive Time: 2 Hours. Kasargod is 90 kilometres from Kannur. Hemmed in by the Arabian Sea on one side and by the Anjarakandy river on the other three sides, Dharmadam Island is a great place to go kayaking. As you take the kayak into the waters you are hit by waves coming in from the sea, but once you cross the sand bars and the waves and reach the river, kayaking actually becomes a peaceful experience. Kayaking here was one of my top Kerala Experiences. To kayak for over three hours, to chance upon a mangrove nest of bats and to even fall into the sea while pulling our kayak out of a sandbar, all of this make some great memories for a non swimmer like me! And to come back to a shack fringed with coconut trees and cool down with water from fresh cut coconuts, is the perfect conclusion to a well ‘lived’ morning. A local favourite, Payyambalam Beach is known for its laterite cliffs, expansive gardens and the sculptures there. There is also the #KannurEye for the Instagram-mers on the beach. This sea front fort constructed by the first Portuguese Viceroy of India, offers delightful harbour views. The chapel, remnants of a secret tunnel out to the sea and the waves crashing into the rocky edge of the fort are some of its interesting features. Drive Time: 10 Hours. Kochi is 370 kilometres from Kasaragod. North Kerala’s answer to the South’s celebrated Alappuzha Backwaters, the Valiyaparamba Backwaters is a scenic setting too, to cruise on the backwaters of Kerala. Verdant islands of tall coconut trees, tranquil green waterways, luxurious houseboats, all make for a more offbeat houseboat experience here. You can book your houseboat for a cruise on the Valiyaparamba Backwaters with The Lotus. One of the oldest ritualistic forms of worship in Kerala, Theyyam is primarily performed in the village temples of North Kerala, particularly in the Kasargod and Kannur regions. The dance of Theyyam can take on many forms, there are as many as four hundred. What we were witness to is the Muthappan Theyyam, where the dance was an invocation of Muthappan, a popular local god. Drive Time: 20 Minutes. Bekal Fort is 17 kilometres from Kasaragod. Overnight on The Malabar Express to Ernakulam. One of the oldest shopping streets in Kochi, they say there isn’t anything you cannot find here at Broadway. This bustling two kilometre stretch of car free shopping alley has been around for over a century. The Bolgatty Palace on this island is the perfect spot to spend an afternoon and catch the sunset cruise out towards the harbour mouth and Fort Kochi, like we did. This elegant dark wood palace with its painted ceilings and Roman columns is the oldest Dutch Palace outside Holland. We took a short ride on the Kochi Metro. What catches your eye though on this whole journey are the stations, each of which is done up in a theme relevant to the local culture. So if it is the wildlife of Kerala in one, then there are murals of the state’s classical performing arts in the next. It is the first metro in the country to extensively use solar panels and also the first Government agency to officially employ transgenders. Drive Time: 15 Minutes. Fort Kochi is 7 kilometres from Kochi. A personal favourite for great street finds (well, I found a whole lot of jewellery with elephants! ), Jew Street is a great place to hunt for antiques and quaint little curios for your home. Built by the Portuguese in 1555 for the King of Kochi, Raja Veera Kerala Varma as a gesture of good will, the Mattancherry Palace, today, serves as a portrait museum. Here you will find carefully preserved and displayed coronation robes of the erstwhile Maharajas of Kochi, their portraits, palanquins, ornate wooden cradles et al. But the most striking feature of the Mattancherry Palace are the exquisitely vivid murals that tell the story of the Ramayana and more in artistic detail. Vasco Da Gama rested here for fourteen years before his remains were returned to Portugal. You can see his gravestone towards the southern wall, as you sit down by the aisle inside the church. And yes, the St. Francis Church was built by the Portuguese friars over five hundred years ago making this India’s oldest European church. Kerala Blog Express ended here and I flew out of Kochi the next morning. * To fine tune the itinerary a little, I would suggest skipping Sargaalaya Arts & Crafts Village on Day 11, getting to Kannur early and spending the day there. Later, using this extra day to drive back to Kochi from Kasargod. ** In certain places I haven’t mentioned where to stay for the day. This is because I would not recommend those particular hotels – that I had stayed at – to my readers. Staying there was definitely not a pleasurable or a comfortable experience. Planning your Kerala Itinerary & have some questions? Feel free to let me know in the comments below and I will get back. A much needed itenary. Feels amazing to come across such a wonderful travel blog. 😄 Glad about it Deddy! Very descriptive and informative..this would be a guiding point for many who wanted to schedule a visit to Kerala..God’s own country.. I had no idea the name translated to the “Land of Coconuts”. That’s a cool fact. Also, I love how detailed you are in your itinerary descriptions. This covers it all..makes me realise that i still have to explore so many places in kerala.thanks for sharing this detailed lust. Kerala is indeed so beautiful. This is extremely insightful with beautiful pictures! Thank you so much! 🙏🏻 Trying to bring together a comprehensive guide that is informative enough to help plan a Kerala holiday.